Darren and I, combined, have moved over 40 times in our adult lives. We completed the overwhelming process of finding boxes, packing, hauling furniture and household items down stairs, making everything fit just right in the truck, and unloading at the other end. Then, as if that’s not enough, we’d unpack everything and try to make it fit in the new location. It’s enough to make you want to settle into one place and never move another object again. This move was different; with a newborn, we had no intention of doing all of the heavy lifting or moving ourselves. If we were moving in our home towns of Moncton, New Brunswick or Sydney, Nova Scotia we would know all of the local companies and pick one based on people we knew or referrals from our friends. In California, that opportunity didn’t exist for us. 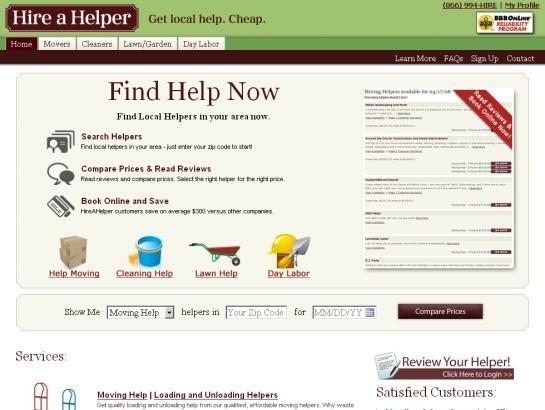 We didn’t know one company from the next and scouring the internet for reviews seemed almost as mind-boggling as moving ourselves; then I found HireAHelper and it was the answer to our prayers. They offer up-front pricing, lots of service providers, real customer reviews, and customer service. I easily reviewed all of the possible options in my area and narrowed it down based on reviews and rates. It was fast and easy, leaving me with more time to play with Athena. I compared service providers in the Laguna Hills area by putting in my zip code and stating when I wanted to move. 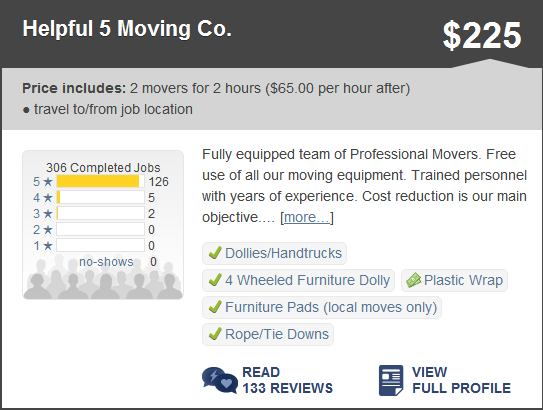 I sorted by how many movers I required and by the hours that I would require their services. I also chose to sort by most reviewed because I thought it would give me the best chance to get a reliable company. I compared prices, customer reviews, and company profiles all in one location. The company I chose had 306 completed jobs and out of 133 reviews, 126 gave them 5 stars. They were an obvious choice. After choosing the right company for our move, I booked their services online by entering my billing information. My card wasn’t charged until the day before the move. Immediately after booking, the company contact information along with reservation details were sent to my email. If something unexpected happened, their truck broke down, their workers got sick, they were running late, I could call HireAHelper immediately and they would spring into action and find another company. They have a vast network of providers so I knew I’d never be stuck. They didn’t release my payment to the service provider until the job was complete. When they were finished, I called the Payment Release Line, it took less than a minute, and the process was complete. From reading reviews, selecting a company, entering my payment information, and calling after the job was done, the entire process took less than 15 minutes. It was like Yelp specifically for movers. What more could I ask for? Well, maybe for them to pack all of my stuff in the first place; I’ll save that for next time. This entry was posted in Uncategorized and tagged bucket list, Bucket List Publications, Lesley Carter, Moving, travel by lesleycarter. Bookmark the permalink. Thanks for that post.Living in California, we don’t have help for our next move and it looks like a move is coming up soon! Oceanside.We moved here from Connecticut. The weather DEFINITELY gets no better! Enjoy NC! It’s beautiful there. That’s good to know since in the future we may make a move. Thanks for the heads up! Thanks.A helping hand is never a bad idea really! Totally agree!! In last four years I have moved four countries… I can very well vouch for using movers and packers than doing all the work yourself.. But the real comfort of helping hand was when we moved back to India.. Since domestic help is not as expensive as its in US or other developed countries; there is someone to do all the cleaning everyday..
oh! thank you! very helpful as we are constantly moving from one place to another..and I am already sick of packing and unpacking..caring furniture and so on… I thought about this one time..but then ..I said no one does it better than you do. But now I just don’t care anymore,I need that time for me and my family while others do this job. lots of kisses and hugs to sweet Athena!!!!! If we ever move again, I think I will hire YOU… after 40 moves you have got to be an expert! On the move in a few weeks – thanks for the great idea! Excellent – did not know such a site existed – my mom can use it for work! Thanks for sharing! Great tip for future moves. Thanks. It seems you had a great experience. Good reference to keep in my list. This is the best link! My mom is going to be able to use this a lot since she is in real estate and people are always needing help with moving! Thank you so much for sharing! This will save a lot of blood, sweat and tears :). Great review Lesley! Your posts and blog are fantastic and I look forward to reading more. When did you leave Sydney? My mom is from there and I lived there for awhile many years ago. Love CB!! Where in Cape Breton is your mom from? Such a small world, eh? lol Do you still visit? I left Cape Breton about 5 years ago, but I lived all over for the last ten years so I can’t really say I’ve been there for an extended period of time since high school (1999). Thanks for the info. I’ve moved aplenty and joke I could pack & move a house in a day. Now with kids and such, I would prefer a good moving company. This sounds great. I miss California and North Carolina. We’re moved 7 times in the past 9 years and I thought that was bad; y’all certainly have us beat!